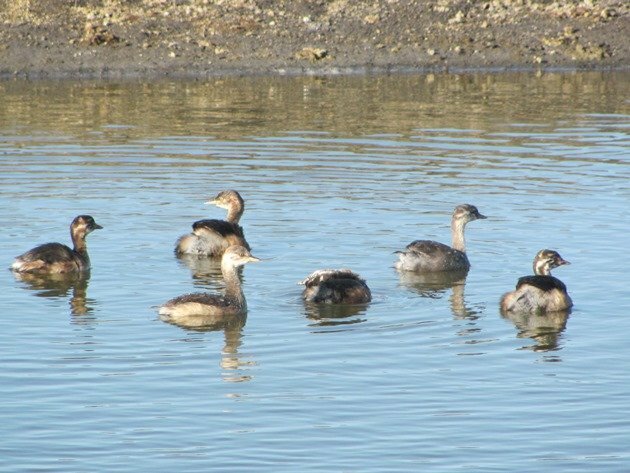 The most common member of the Grebe species around Broome is the Australasian Grebe-Tachybaptus novaehollandiae and it has taken advantage of our exceptionally good Wet Season early this year and has been breeding very successfully. 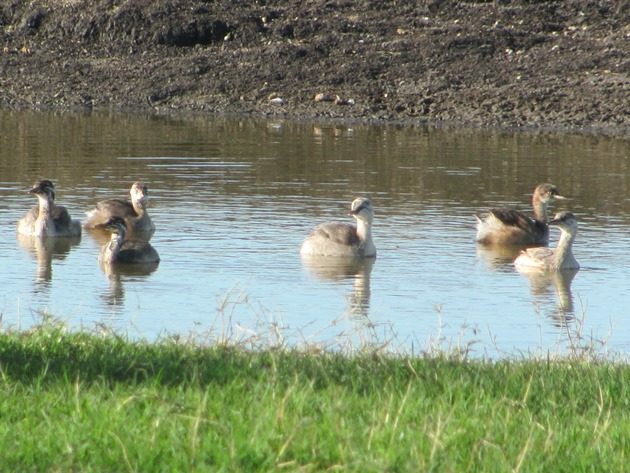 Several bird species arrived in Broome early in the year and have bred successfully and this has included Plumed Whistling-Ducks, Wandering Whistling-Ducks, Magpie Geese, Australian Painted Snipe, Australian Crakes, Black-winged Stilt, Red-kneed Dotterels, Purple Swamphens and Masked Lapwings. 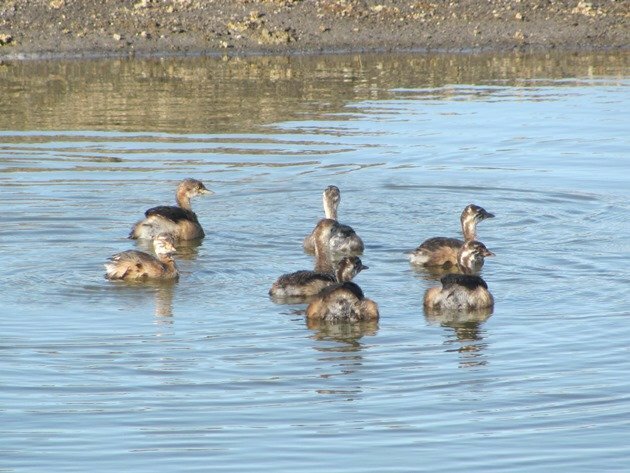 Australasian Grebes will take advantage of good conditions and raise up to three clutches of eggs and by the numbers of birds currently around the Broome area now it does appear that they took advantage of the big rain even early this year. 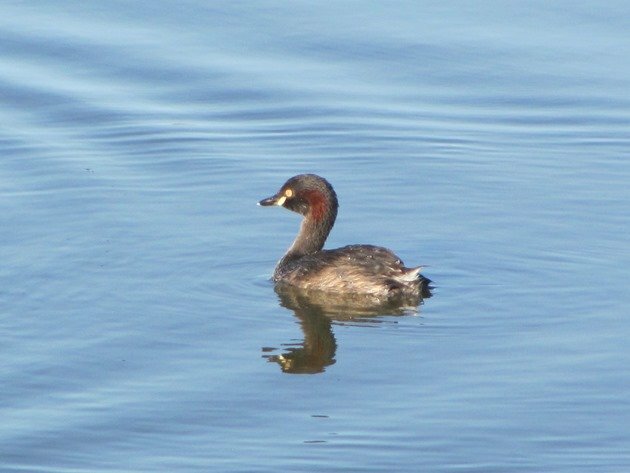 During breeding season the Australasian Grebe has a very distinct pale yellow patch at the base of the bill. 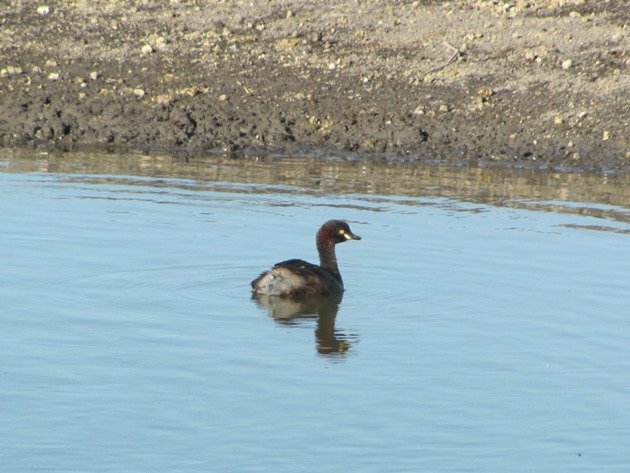 This is a bird species that much prefers to dive instead of fly, so taking photographs can be problematic. However, they do appear to be on the surface a little longer when they are surrounded by juvenile birds and offer photo opportunities. Finding a family group of Australasian Grebes in a small pool left behind from the rains earlier in the month right against the main highway in the late afternoon offered a chance to photograph them in favourable light. 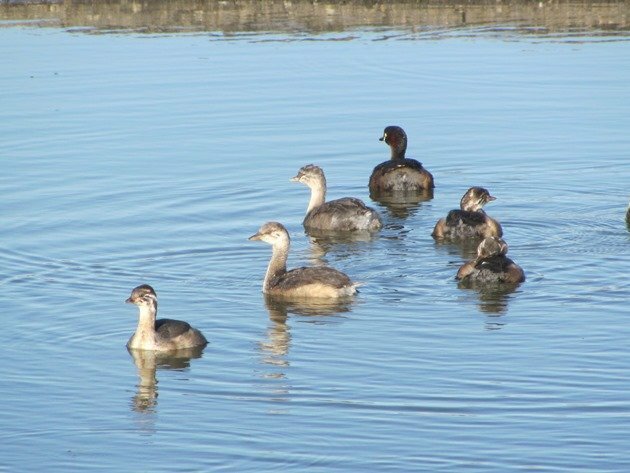 The juvenile Australasian Grebes have distinct stripes around their faces, but were keener to swim away that towards me, so there are views from most angles! 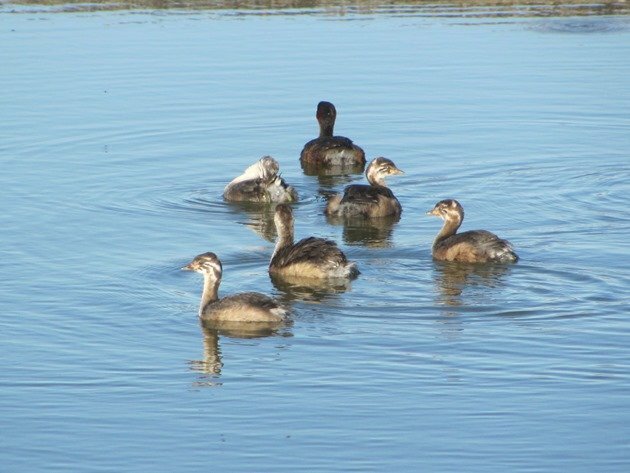 The adult Australasian Grebes have a much darker head in breeding plumage with a distinct chestnut patch of feathers and the eye is very bright yellow and the young birds kept close to the adults. 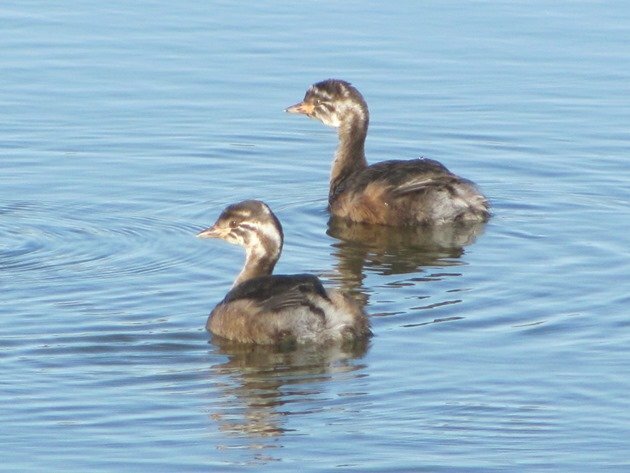 For a brief moment there were two juvenile Australasian Grebes swimming in good light clearly showing their striped heads and I could capture them with my camera! Once the Australasian Grebes lose their breeding plumage they will be harder to tell apart from the Hoary-headed Grebe–Poliocephalus poliocephalus. Hoary-headed Grebes are slightly larger birds and they do tend to fly rather than dive when they feel threatened. 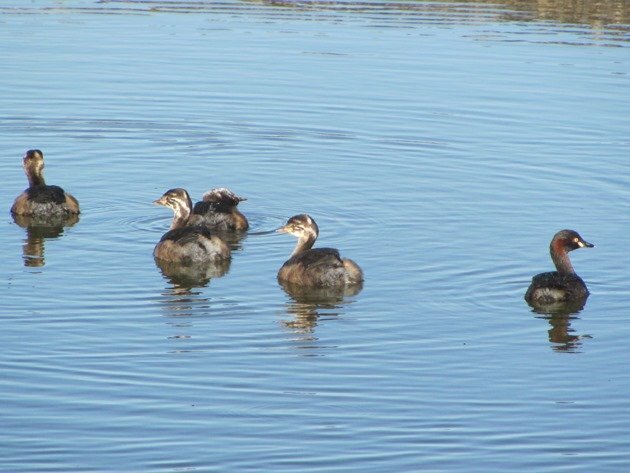 The Australasian Grebes also have a yellow eye and in non-breeding plumage have darker feathers on their heads through to their necks.